Published: Sept. 29, 2014 at 04:58 p.m. Updated: Sept. 29, 2014 at 05:15 p.m.
Florida State QB Jameis Winston's negative headlines have alienated some residents of his hometown. Florida State's Jameis Winston has his fair share of critics, and they've only become more vocal the past month or so as the quarterback continues to create headlines for his off-the-field actions. Now he's hearing it from an unlikely source: his hometown. Winston detained by police at gunpoint, and investigated for damage at apartment complex from BB gun fight. 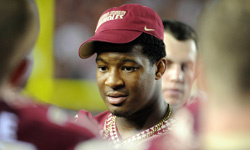 Winston was not charged with sexual assault after being under investigation in a case from Dec. 7, 2012. Cited for shoplifting crab legs from a grocery store. Suspended for shouting vulgar remark in FSU's student union. Investigation reveals that FSU and Tallahassee police hid sexual assault allegations. 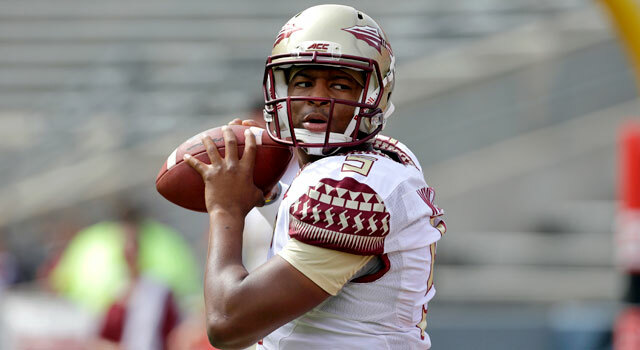 Florida State investigating if Winston accepted money for autographs. "He's an embarrassment to Hueytown," Hueytown, Alabama resident Pam Miller told AL.com. "But the bigger issue is that this young man is ripping apart his future with his own hands. It's like a runaway train. You know it's going to wreck, but all you can do is watch. It's terrible and it's tragic." It should be noted that this is the same hometown that held a "Jameis Winston Day" in July. Winston led the Seminoles to the national title last season and picked up the Heisman Trophy along the way. However, his time in Tallahassee has been marred by various off-the-field incidents. He was accused of a sexual assault last year that continues to generate headlines as the school looks into the quarterback as part of a Title IX investigation. He stole crab legs from a grocery store over the summer. The latest incident, in which he shouted obscenities from a table on campus, prompted the athletic department to suspend him for FSU's narrow win over Clemson two weeks ago. His hometown is, apparently, as fed up with Winston's actions as the rest of the country. "Jameis doesn't have any respect for women and it's like he constantly needs attention," local resident Gary Jennings added. "He's embarrassed Hueytown. If I were his father, I would have had a serious, serious talk with him a long time ago. I'll still root for him, but I fear for him." The quarterback has long been viewed as having the talent to be taken in the first round of the NFL draft, but the past several months have seen his stock drop like a rock in scouting circles. So, too, has Winston's reputation in his own hometown, apparently.